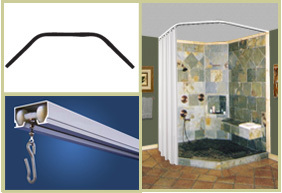 TRAX Ceiling Shower Rods (tracks) can be customized to fit your needs using straight and curved sections. –See examples of shapes to the right. Shower rods are mounted to ceiling to visually open up your space. 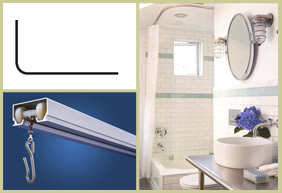 Eliminate the shower rod across your field of vision and make your bathroom feel larger. Shower curtain glides easily on wheeled hooks, even around corners. 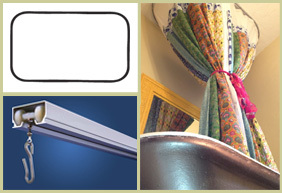 Everything needed to hang your curtain is included: Tracking, hooks and rollers, screws and drywall anchors. 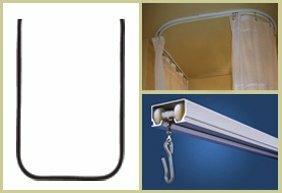 Ceiling tracks are easy-to-install and come with easy-to-understand instructions. Easy-to-work with customer service is available by telephone to help you select the track, and/or curtain you need for your application. TRAX are maintenance-free, using durable and long-lasting components that will not rust or corrode. 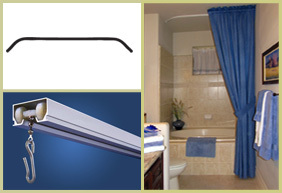 TRAX rods, as-well-as customized shower curtains, made-to-order, ship within 2 days. 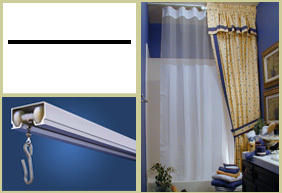 Customized shower curtains, adjusted in length and/or width to fit your shower, can be ordered along with custom shower tracks.